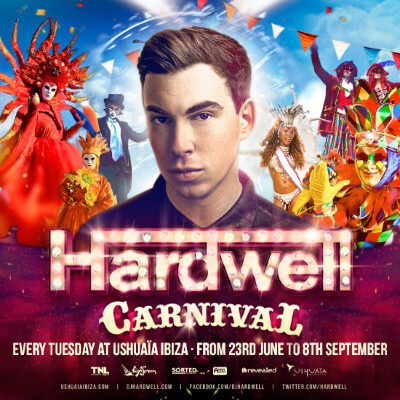 Following a summer that saw the Dutchman complete his debut residency on the island of Ibiza, the Revealed Recordings head honcho Hardwell now returns to Ushuaïa Ibiza for another season with his exclusive show – Hardwell’s Carnival! He will appear every Tuesday for 12 weeks and his team have been busy working on choosing an array of A-list artists and emerging new talent for this year’s season, with full line-up details to be announced very soon. The Carnival concept combines the festivities of dance, culture, costumes and music, surrounded by stilt walkers, masquerades and carnage-creators. Hot off scooping five IDMA awards this year including ‘Best Global DJ’ and 'Best Podcast or Radio Mix Show' for his globally syndicated ‘Hardwell on Air’ show, Hardwell takes his total of industry-recognised IDMAs received to 11. With his debut album ‘United We Are’ shooting up the global charts to claim the #2 position on the iTunes Album Chart worldwide, his next offering may follow in similar suit as he readies for the release of his track ‘Follow Me’ featuring Jason Derulo. Hardwell recently had the launch party of his ‘United We Are’ album and his world tour, which took place at Amsterdam’s Ziggo Dome with two sold-out events. During the weekend’s launch event Hardwell beamed his sound global once again with many tuning into the live stream.